Long before there were boy-bands and teenaged celebrities, there was Sonja Henie. Born in Oslo, Norway in 1912, Sonja was adept at many sports, but settled on ice skating as her first love. By age fourteen, she won her first world championship, and captured the title for the next nine years. In a sport dominated by men, where women’s competitions were an afterthought, she burst onto the scene and captured the hearts of audiences. 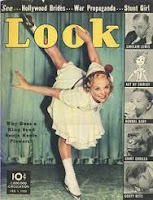 After a successful amateur skating career, she transitioned to Hollywood star with seemingly little effort. 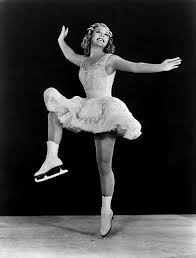 Credited with being the first female skater to wear short skirts, white boots, and use dance choreography, Sonja’s skating techniques were groundbreaking. Her glamorous persona transformed the sport and its place in the Olympic games. However, she was not without controversy. However she may have learned during the lunch she had with Hitler at his nearby hideaway, Berchtesgaden. She kept up her Nazi connections after her movie career started. 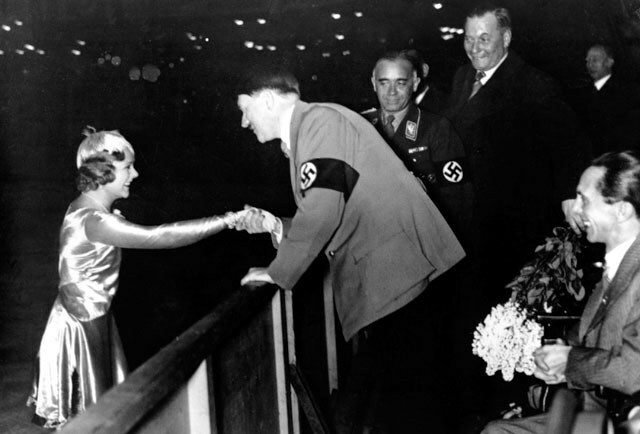 Joseph Goebbels personally handled the released of her film “One in a Million,” in Germany. During Germany’s occupation of Norway, troops reported that Hitler’s autographed photo resided on the piano in the Henie living room. As potential proof of her collaboration, none of the Henie property was damaged or confiscated during the occupation. Although supportive of the Allied cause through appearances in USO shows, Sonja never made any negative comments against the Nazis during the war. Whatever her connection to Germany, Americans loved her in film and on ice. Her Hollywood career was so successful, her estate was valued at more than $45 million at the time of her death in 1969 at the age of 57.